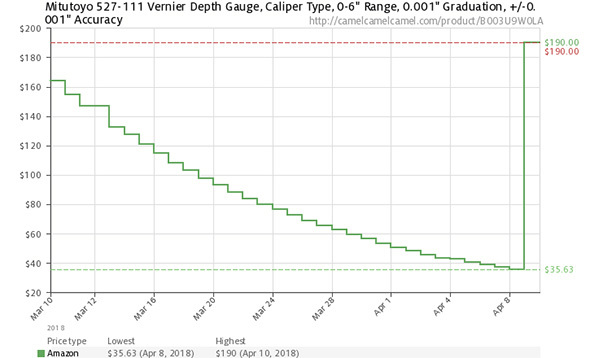 About two weeks ago, I was checking my Amazon wishlist for something (the slow and annoying way because they recently disabled the built-in search box), and came across a Mitutoyo vernier caliper-style depth gauge. When I came across it, the price was $75 or so. I added it to my cart, and “saved it for later.” The next day, it dropped in price again. I kept watching it, and the price kept dropping, once a day or sometimes every other day. It kept inching lower and lower. Amazon does this on occasion. I’m guessing that if the algorithm knows a product is being watched, and they want to move old stock off the shelf, they drop the price systematically like this. From the price tracker, it seems they’ve done this for this product before. I have a Mitutoyo depth gauge micrometer, with quick-switch depth rods, and so this caliper-style gauge isn’t something I needed. I figured that I’d order one or both of them if the price got down to $25. I guess that someone else was watching it too, or came across it as part of an immediate search. After they ordered their one tool, Amazon’s computers reset the price to MSRP. That was a heck of a deal the person got, saving nearly $155 off the $190 price. Maybe I should have ordered one at that lowest-ever price, but I was more curious about how low the price could get. This is just a screenshot of our discount-finder widget. This might also be a good time to remind you about our Amazon Deal Finder. It’s a simple widget that sorts through Amazon’s search results to filter out the highest discounted items. It doesn’t work as well as it used to, or rather Amazon’s search results and product data has changed over the years, becoming more cluttered. Still, our Amazon Deal Finder still turns up deals every now and then when I check it. Not “deals,” exactly, it might be more appropriate to describe them as pricing anomalies. For instance, these Knipex Circlip pliers are currently $12.31 on Amazon, but $25+ elsewhere. A price tracker shows that it lives around this price but goes up and down. Tracking info only goes back 3 weeks, and shows a low price of $7.66 in March. This Gedore 1/2″ socket set is currently $182. But check out its $485 price at KC Tool. This Williams 3/8″ socket set appears to be a lot less expensive than it’s selling for anywhere else. So is this Williams (imported) 1/4″ socket and drive tool set. You can save a bunch on this Gedore hex key set. Here’s a Triumph 29pc drill bit set at what looks to be a great price. This 21pc set also looks to be a good price. What do you think? Potentially useful, right? I’ve saved a bit of money using this widget, but it can be frustrating to use. I only use it every now and then these days. While it requires a bit more legwork these days, it’s fun to play around with. Some of the deals I found quickly just now are very good. There’s nothing I’m interested in ordering immediately, but I’m motivated to want to revisit the widget later today when I have some more time. Sometimes things are very grey. Is this Felo Inox screwdriver set a good deal? It looks like it is, but it’s hard to be certain since a Google search doesn’t turn up any familiar distributors. You can access our deal finder through the links here, but it’s also linked-to at the bottom of every page. It’s in the bottom-most menu. We Have an Amazon “Influencer” Page – What to do with it? Amazon Prime Day 2017 is Coming!!!!!! But Let’s Not Overreact Custom Tool Quotes and Price Checks Amazon Same-Day Shipping – I Love it! « The Best EDC Screwdriver with Bit Storage? I seem to have the exact opposite experience of you when leaving items in my cart. Maybe it’s just coincidence or I’m not buying old stock but almost every time I forget to ‘save for later’ and then ‘move to wish-list’, the price jumps. I’ll make a note to watch for the number left in stock as this may have a bearing on the price movement as you pointed out. I have no idea what triggers Amazon’s algorithm to drop prices the way they do. I don’t think inventory count is a trigger, but that a purchase can “reset” the price. I’ve watched prices drop in the past, or I would come across an anomalous price, and then watch the price jump up after purchasing an item. It was rarely immediate. But with the Mitutoyo depth gauge, I’ve been watching it daily, then BAM the price jumps up. I then noticed the inventory count, and it seemed to fit that pattern that someone must have bought one and then the price reset itself as a direct result. Recently I noted a change in it, I think now it needs to actually be in the cart whereas about 2 months ago it worked for items in your wishlist as well, just my observation, maybe be dependent on the item and seller, but with what I’ve been looking at it seems to be true. Amazon’s prices only go down when there is either a 3rd party seller with a new one for a good bit less, or the price goes down at whatever online competitors they’re matching automatically. I’ve seen stuff go down quite a bit, but never like the calipers did. I have to think there’s something special about that case, since I’ve had the same experience as others – if I watch something or add it to the cart, the price goes UP, not down. I seem to get the lowest prices or close to it when I just check stuff out without signing in, and then only sign in and add it all immediately before buying. That’s a good tip about only signing in when checking out. I always set my Firefox session to sign in automatically but I’ll try your method. Thanks. They used to offer Gold Box discounts on items people were watching, and I think I remember them getting in trouble for offering lower prices to new customers. These days though, everyone sees the same price. Lots of factors can affect price. I found that they were price-matching a tool that they didn’t even have in stock yet, or direct distribution channel for. Home Depot had a Milwaukee Hardline knife on sale as a deal of the day. They matched the price, even though it was Temporarily Unavailable. Amazon isn’t an authorized Milwaukee dealer, so I don’t even know where they were getting the tools from. Maybe the listing was just a search engine results strategy? Amazon prices can be far more erratic than a lot people realize. One day something will be a good deal and the next day it is more than you would pay pretty much anywhere else. They usually stay within a given range and not every item changes price often but it can be frustrating. This just happened to me on Amazon.ca with a Makita autofeed screwdriver. 3 in stock, price drops over several days, then I log in to buy it last night and stock has dropped to 1 and price is back up. Darn it! I agree with the frustration. I read that Amazon wants to be competitive in price, but not necessarily the cheapest. For example, say Amazon has an item for $100. Another merchant adds a listing for $88. Quickly, the Amazon bots drop it’s price to $90. If Amazon drops it’s price within 30 days of a purchase, just email them and they have reduced the price. I buy a concentrated Techron fuel injection cleaner. The price is $11 one week, then $17 the next, then back to $11. I have seen this for over a year! The exact same thing happened to me with a book today that’s been in my cart forever. I didn’t even realize it had dropped into the $20-some dollar range, and all the sudden it shot back up to $92 and the product page now says “1 in stock, more on the way”. What was their reasoning for removing search from wishlists? It’s a pain. I emailed several times, and each time I had different responses. “We’re looking into it,” “some customers see experimental features,” instructions on how to search for a product on Amazon, instructions to control-F to search. I have dozens and dozens of items in my wishlists, and now the only way to see them is to scroll. They also stopped support for their browser “add to Amazon wishlist” add-on, which I had been using to build wishlists and post ideas lists. They replaced it with a more intrusive add-on seemingly meant to grab sales from competitors. I was really put off last week when I knew I had some absorbent mats saved in a wishlist somewhere and couldn’t find them. I gave up looking and went and ordered from New Pig’s site directly. 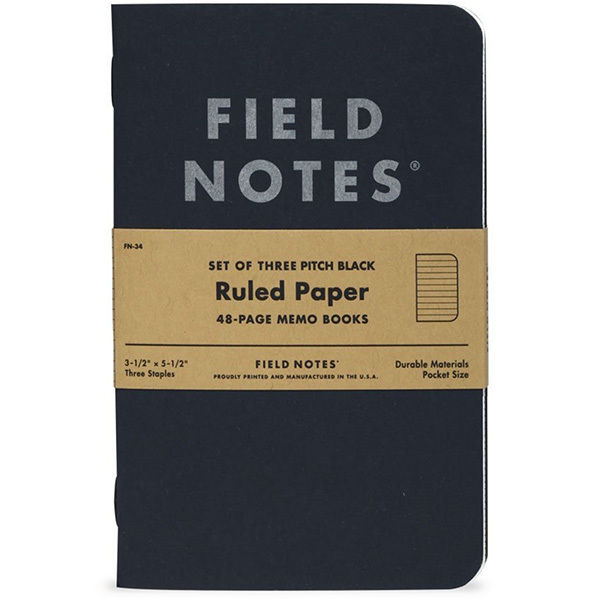 This is likely to happen more often if I have to fumble around my lists. Now that they have you they seem to like to reduce functionality from the things you use. Search by name is gone and so is sort by % off. The search by name really kills be because some of my wish lists are too big. Oddly except for the Gedore 1/2” socket set for $182 every single other link Amazon lit up was waaay off. The pliers when from what $12 to $45. AKA full retail.? So everything I was kinda interested in was 2 to 5 times what you were able to post and even their live links were completely inaccurate. Hmmm. The prices likely shot up because people bought the discounted tools, triggering a price reset. For some of them, there could have been multiple purchases before the algorithm took notice and reset the prices. There’s really no way to understand how or why Amazon’s pricing algorithm does things. I’ve scored lots of great deals on amazon.ca – usually the price jumps all the way back right after I place the order. -10″ Channellock nippers for $9.55 (now $32.12) – yeah, having 10 & 11 is a little silly, but at that price I couldn’t resist! That’s not everything either, just some examples from looking back at my order history. Whatever crazy rationale they have for doing this – it works for me! I don’t always have these products in my cart when the price drops start, so I don’t think that’s required. It’s almost like they start to drop the price as an experiment to see when someone will bite. I scored the best deals on products I didn’t really need – and hence was willing to hold out for a ridiculous price. I’m a bit suspicious of Mitutoyo’s sold on Amazon. I’ve heard of decent fakes doing the rounds on Amazon comments. AvE also had a teardown video of a fake and if you’re not looking to spot the difference, it’s very hard to see. I don’t know if this is an issue with Amazon and / or its Marketplace sellers. I bought a number of Mitutoyo tools on Amazon without issue, but the prospect of counterfeits is concerning. I guess a “Fulfilled by Prime” seller might send counterfeits over, with the counterfeits added to current inventory? That could potentially be a problem if Amazon doesn’t segregate products by different sellers. I think the issue with Mitutuyo is that some of their products are not being made in Japan but in Brazil recently. 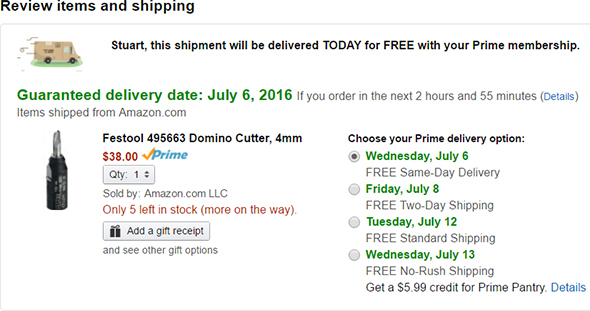 I bought a highly-rated item on Amazon with Prime shipping – don’t recall it was directly from them or fulfilled by Amazon. The rough appearance of the item caused me to add a review to balance out all the 5 star reviews – suggesting that what I received was not a 5-star item and/or that there might be QC issues with the manufacturing process. The manufacturer contacted me – sent me a replacement and a mailing label to return the first one. The new item was indeed a 5-star product. Later on I got an email from the manufacturer asking for more details about my order and telling me that the first item I had received was a counterfeit. I don’t know how many counterfeits are being sold on Amazon – but I guess considering the size of the Amazon marketplace – and the number of scammers out in the world – its not surprising that it happens more often than Amazon would like. My pet peeve with Amazon pricing, is not so much the volatility – but rather that they build shipping costs into much of what they sell on a per unit basis – and do not offer discounts for buying in quantity. Many times their unit price with “free Prime shipping” is equal or better than third parties with shipping – but if you are buying in bulk their price gets to be way off. Stuart, DCD and fred, thanks for your replies. I went tool hunting in Japan recently in both Tokyo and Kyoto – you can’t beat walking into the shop and picking the tool up and testing / examining it. I believe I got fair prices for the Mitutoyos too but will have to double check. My issue with Amazon is that for counterfeits etc, I don’t think they really care and seem to have very little appetite to do anything constructive for the buyer. That said, I am a fan of Amazon. I use Amazon.de (no third parties via Marketplace) to buy German hand tools such as Knipex and Wera as they are often cheaper than buying from Amazon.co.uk despite the exchange rates and have had positive experiences. That said, Amazon.co.uk is cheaper to buy German power tools when compared with Amazon.de. In general, I wish Amazon did more to police both the product counterfeits and the spam comments. For tools, they could also benefit with proper categories and enforcing proper titles, summaries and descriptions – some are absolutely desperate, even those listed by Amazon themselves. What about using camelcamelcamel for pricing, if only for the price graph to see the wild swings? I have used it for purchases, but usually just use it to see the price fluctuations. That’s where I got the price chart, above. They can be useful to see trends. I don’t trust them very much, because they’re slow to update. After the price went up to $190, they were still showing $36. I find buying through my buisness account on amazon, saves a lot of money and gets better deals.. if you want the latest and greatest tools, acme, tool up, tool nut are the best…amazon usually has the newest tools after them ..
They’ve been after me to open a business account. I’m open to it, but am waiting for a promo like last year’s “open a business account, get a free Echo Dot” offer. They really have different prices or promos for businesses? Bump. I wouldn’t mind if you expanded on this: “saves a lot of money and gets better deals” as I was considering a business account myself. As of yet, it hasn’t passed the decision matrrix. Also, didn’t know there were ever promos for signing up so that’s one additional pro.